Registration for ‘The Gathering’ costs N5,000 (Five Thousand Naira) per adult. Star Prize – is the purchase of an Aprilia Shiver 750cc valued at Two and a half million naira (N2,500,000) for One million naira (N1,000, 000). You can register as many times as you want. Winning registrants need to be present to win. By registering for ‘The Gathering’ and obtaining an entry pass, winners agree to allow the Superbike Clubs Association of Nigeria (“SCAN”) to release their names and use their likeness to promote ‘The Gathering’ Lucky Dip, or to announce the winner. No compensation will be given for the use of photos and/or testimonials. Winners will also be listed on the website within ten (10) days of the Lucky Dip. The Lucky Dip is conducted by SCAN with the physical address of Penthouse Suite B, Bannex Vina Plaza, Plot 741 Aminu Kano Cresent, Wuse 2 Abuja FCT, Nigeria. The Official Rules of the Lucky Dip are set forth herein. By entering the Lucky Dip, registrants agree to be fully and unconditionally bound by these Official Rules, waive any rights to claim ambiguity in the Lucky Dip or these Official Rules and further agree to be bound by SCAN’s decisions and interpretation of these Official Rules. The Lucky Dip is open to all persons aged 21and over. Members of the Board of Trustees of SCAN, presidents of all member clubs, and their spouses and children and any other persons involved with this event are not eligible. The Lucky Dip is subject to all applicable federal, state and local laws and regulations, and is void wherever prohibited or restricted by law. How To Enter: Registration costs N5,000 (Five Thousand Naira) each. – Bank deposit: Make your cash deposit into Ride Easy Limited, Zenith Bank account number 1012423102, and be sure that your full name and phone number are indicated on the teller. Contact Eddie Oseni on 08035129386, and provide your full name and phone number. After your payment has been confirmed, your registration will be processed in your name and you may collect it at the venue. – Each registration form is personal and can only be in the name of one (1) individual Registrant. – Registrants may not sell, donate or otherwise transfer their Entry Pass(es) to anyone. – Prizes will not be issued to anyone other than the one (1) Registrant, whose name is on the Registration Form. – Title to the bike, shall be taken in the name as it appears on the Entry Pass stub and is not transferable or assignable. SCAN reserves the right to disqualify false entries or entries suspected of being false, and any illegible, defective, incomplete, or physically altered Registration Forms that do not include valid or complete payment. SCAN is not responsible for printing errors in any Lucky Dip-related material, or for lost, late, misdirected or non-delivered mail, or any other failure to receive registration forms prior to the date of the Lucky Dip. Lucky Dip will be held at the Vantage Beach Hotel and Resort, Block 1 plot 3, Okunde Blue Water Tourism Scheme, Oniru-Lekki, Lagos on the 21st of November 2015. 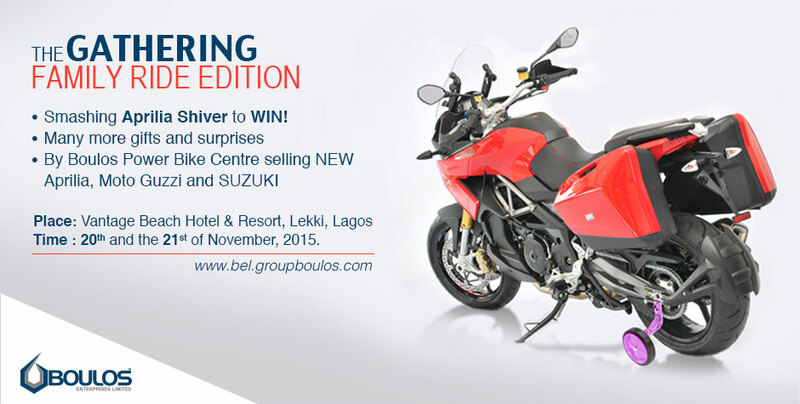 The Star Prize is the purchase of an Aprilia Shiver 750cc valued at Two and a half million naira (N2,500,000) for One million naira (N1,000, 000), sponsored by Boulos Enterprises Limited and visible on www.superbikecan.com. Registrant, whose Entry Pass number is picked at the Lucky Dip, will be deemed the winner of the prize for that particular Dip (“Lucky Dip Winner”). Lucky Dip winner will be formally notified by phone, email, or SMS, using the information provided on the Registration form. If any Lucky Dip Winner cannot be located, or fails to return attempts to contact him/her by 5.00pm on the Fifth (5) business day after SCAN’s first attempt to contact him/her, such Lucky Dip Winner will be deemed to have forfeited his/her prize. Prizewinners will be required to sign and return a Declaration and Release Form, which among other things, releases, SCAN its officers, employees, representatives, partners, and agents, and any person or entity associated with the production, judging, or administration of the Lucky Dip (collectively, the “Releases”) from all liability relating to the Lucky Dip and acceptance and/use of the prize and confirms his/her compliance with the terms and conditions applicable to the prize. Lucky Dip Winner must provide all information requested to be eligible to win, including proof of identity showing that the persons claiming the prize is the same Registrant named on the winning Entry Pass stub. Unless restricted by law, each Lucky Dip Winner will be required to complete and return the Release within fourteen (14) days of prize notifications. The prize may be forfeited if Lucky Dip Winner (i) cannot be reached; (ii) fails to obtain all signatures on the Release and to return the documents in a timely manner as required pursuant to these official rules; (iii) fails to pay the sum of N1,000,000 (One million naira) ten days after the Lucky Dip in order to claim the Star Prize, or (iv) cannot accept or receive the prize for any reason. Lucky Dip Winner grants permission for the use of their name, photograph/likenesses for advertising and promotions for this and similar promotions without compensation, unless prohibited by law. The Lucky Dip is subject to these Official Rules. These Official Rules shall not be changed by any oral statement made by any employee or other person acting on behalf of SCAN. (i) To be bound by these complete Official Rules and the decisions of SCAN, which shall be binding and final. (ii) To waive any rights to claim ambiguity in the Lucky Dip of these Official Rules except where prohibited by law. By accepting a prize, Lucky Dip Winner agrees to release SCAN, its officers, employees, representatives, partners, and agents, and any person or entity associated with the production, judging, or administration of the Lucky Dip (collectively, the “Releases”) from and against any claims, damages, disability, attorney’s fees, and costs (including death) or property of any kind resulting in whole or in part, directly or indirectly, from redemption, acceptance, possession, ownership, misuse, or use of any prize or participation in any Registration for an Entry Pass. Acceptance of a prize constitutes permission for SCAN to use said Lucky Dip Winner’s name, photograph, likeness, statements, biographical information, voice, city and state address for promotional or advertising purposes in connection with this Lucky Dip on a worldwide basis, and in all forms of media, now or hereafter know, in perpetuity, without review, permission or further compensation. Taxes, and their levies if any, are the sole responsibility of Lucky Dip Winner. The Lucky Dip Winner must claim the prize within ten (10) days of the Lucky Dip picking date, or forfeit his/her prize. In no event shall SCAN, its officers, employees, partners, agents or representatives be liable to any party for any loss or injury to earnings, profits or goodwill, or for any incidental, special, punitive or consequential damages of any person or entity, whether arising in contract, to or otherwise, even if advised of the possibility of such damages. SCAN reserves the right to cancel the Lucky Dip without prior notice due to reasons outside its control. An example of cancellation may be due to insufficient ticket sales. All personal information collected by SCAN will be used for administration of the Lucky Dip. SCAN will not share, sell, or otherwise distribute personal information collected by SCAN except as stated above. A list of all prizewinners will be posted on SCAN’s website within ten (10) days of the Lucky Dip. Awesome Accomodation Deals from SCAN and its Hospitality Partners For The RR Participants & The Gathering Attendees!! !